If anyone is wondering why Randy Hughson had to leave Adam Pettle’s “Zadie’s Shoes” when it was extended, they need look no further than the Tarragon Theatre Extra Space. There Hughson is the sole player in Morris Panych’s latest play “Earshot”. 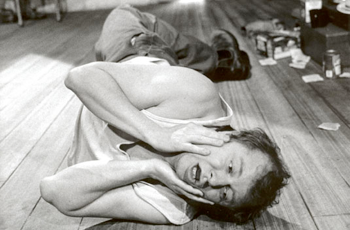 Hughson plays Doyle--unkempt, unemployed, single and thirtyish—who is disturbed mentally and physically by his hyperacute sense of hearing. (Panych has Doyle say it is “infrasonic”, but that is incorrect since Doyle hears sounds both above and below the normal pitch humans can hear.) Doyle cannot just hear a pin drop, but a pin dropping through the air before it hits. The 80 minutes of the play is made up of a series of short scenes separated by blackouts constituting one nonstop complaint by Doyle about the sounds he hears around him, particularly of his neighbours above and below and to the left of his apartment. The sounds of his neighbour to the right, Valerie, he cherishes since he is in love with her. The plot, such as it is, involves Doyle’s composing and sending of a letter to Valerie declaring his love and pointing out that by the time she has finished reading the letter he will have shot himself out of love for her. Unfortunately, Doyle’s complaint and this plot are not enough to sustain even 80 minutes. What is humorous and unusual about Doyle’s circumstances in the first 20 minutes soon becomes merely tedious and repetitious for the next hour. It is difficult to believe that someone who has had such bizarrely acute hearing since childhood should still be jolted by every sound and should still be ranting about his condition as if it were new. I suppose, in targeting his various neighbours for infringing on his hypersensitive ears, the play is meant as a kind of theme and variations. But the theme is extremely limited and the variations are not all that varied. Doyle ultimately wishes all his neighbours dead, save Valerie, so they won’t disturb him anymore. The minute cataloguing of all their various auditory transgressions might be relished on the page, but on the stage is devoid of dramatic interest. Doyle’s prime target is Mrs. Noon, the elderly woman living to his left, whose husband has died two weeks ago and who still wanders the apartment calling his name. Doyle savage critique of her age, her infirmity and the pointlessness of her continuing to live will strike fans of Panych with a sense of déjà vu (or is it déjà entendu?). Doyle’s long, complex, multi-adjectival sentences and tone of bleak irony are in no way different from those of Kemp in Panych’s play “Vigil” of 1995. Doyle is really just Kemp with a new ailment. His longing for the unattainable Valerie is a substitute for Kemp’s longing for parental attention. Even the ending of the two plays is strangely similar. Doyle’s efforts, like Kemp’s, bring about exactly the opposite result he intended, indeed, a result he did not know he actually wanted. Beckett, of course, could take a figure from a two-person play and make her the sole character in a one-person play (e.g., Winnie in “Happy Days” becomes Mouth in “Not I”), but Panych is not Beckett and the isolation of the character does not bring with it an increase in intensity or implication. Randy Hughson makes an heroic effort to make this unrewarding material engaging. Indeed, his acting, combining frenetic gestures with deadpan delivery, is the main source of interest in the evening. Ken MacDonald’s neo-Expressionist set, under John Thompson’s lighting, is also a joy in itself. He presents us with Doyle skuzzy apartment finely detailed and beautifully broken down, but with it lines so askew and its perspective so forced that its depth is an optical illusion. As with Hughson’s acting, MacDonald’s visual interpretation of the play is more intriguing than the play itself. As one might expect a work so obsessed with noise, the sound design is of utmost importance. Here Derek Bruce succeeds handsomely with speakers placed both under and above the set and to either side to mimic the locations of Doyle’s neighbours and the sonic disturbances they make. The sounds are so precise that once Doyle introduces them we really don’t require further elaboration. Panych, directing his own play, makes some odd choices. Ultimately, we have to wonder why Doyle is speaking and whom he is addressing. Panych makes clear that Doyle’s own chewing disturbs him, so why not his incessant talking? If we are supposed to be overhearing Doyle’s thoughts, why does it seem that Doyle is expounding them to an audience which he frequently addresses directly? This rapport with the audience causes our sense of Doyle’s isolation to evaporate. By contrast, there was a far greater sense of isolation and heightening of tension in “Vigil” between the abusive Kemp and the kindly, non-responsive woman in bed. Despite MacDonald’s wonderfully skewed set, I can’t help but think that this play about sound would be more effective on the radio. Then Doyle’s monologues would seem less like addresses to the audience and more like thoughts overheard. Then, too, an ambiguity could be developed as to whether the sounds Doyle hears are actually outside his head. Then, a more complex soundscape could be developed to render the noises of the outside world simultaneously (as Doyle must hear them) rather than sequentially as clarity in the theatre necessitates. As it is, there is less in Panych’s latest play than meets the ear. Photo: Randy Hughson. ©2001 Cylla von Tiedemann.